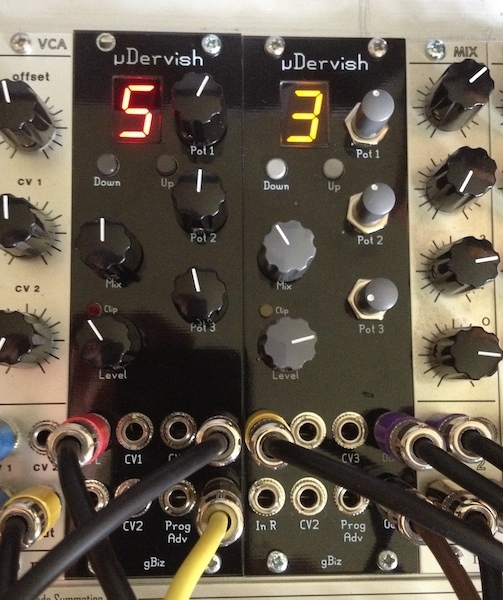 This thread is for µDervish, the 8HP Spin Semiconductor FV-1 DSP based eurorack FX module. The 12HP Dervish thread is here. Feel free to ask questions, either in this thread, or email or PM me. - Yellow 7seg LED. (Mouser only sell the red & green versions of the Kingbright SC05-11 LED i'm using. Yellow looks best IMO. RS sell the yellow ones so they're easy for me to source). Prices for parts & shipping are detailed in the DIY ordering page here. There are Mouser carts for the remaining components, with the exception of the Thonkiconns jacks, 3 x Alpha pots, knobs. Links to the carts in the BOM spreadsheet. One programmer shield PCB will be bundled with each order. There's an FPD file for people who want to make their own panel. Default EEPROM image contains 4 banks (list of contents here. µDervish can support from 1 to 11 banks. This is user configurable from the programming environment. This file details the programs and the control mappings. The second post in the Dervish thread (link) has links to some example sound clips, video(s) etc. µDervish uses the same DSP board as Dervish, but replaces the 12HP control board with a simpler 8HP version. The inspiration for µDervish was a request for a "live" or "performance" version of Dervish where the OLED screen isn't required to provide feedback on the program currently running. - the individual pots that control level & mix of L & R signals are replaced with dual pots. - adds an additional control input "Prog Adv" that can be used to advance the program. (See the user guide for details, link below in the UI section). - replaces the OLED screen with a 7-seg LED. - the default EEPROM image has a soft limit of 4 program banks, though this is easily changed as required from the programming environment. (See the user guide for details, link below in the UI section). - retains the Teensy3 based programmer & programming environment. As the EEPROM format is mostly identical, changes to the helper scripts to support µDervish are minimal. The scripts have already been ported to include µDervish support. I want to keep 7seg display menu diving to an absolute minimum. Though that does mean additional customisation is moved to helper scripts & the I2C programmer. The user guide (here) (sorry, text only for now) details the current UI. One of everything - I can have my Dervish at home and the micro in my portable case! I'd appreciate some advice in what to include in the default EEPROM image. From what i've seen, most builders don't seem to do any programming of the Dervish once it's built, so i'd like to try & get this right. This page details the bank/program configuration of the current Dervish image. Assuming that the equivalent default image for µDervish (the one i include in pre-programmed EEPROMs) will have just 2 or 4 banks accessible from the UI, i'll need to create an image that reflects that restricted config. I'm currently thinking about 2 banks of reverbs & 2 of delays. But not sure which programs to include. These banks don't have to be existing ones, they can be new ones containing a mix of programs from other banks. Also, how many banks should be available from the UI ?. For simplicity, i think 4 at most. I realise that some programs might need their controls changing so, say, all the reverbs in a bank have the same function mapped to the same pot where possible - eg pot 0 is pre-delay, pot 1 is decay, pot 2 is damping. For me I would be putting my 8 'go to' programmes on it so it wouldn't matter so much. But again for me - essentials would be the Reverse Reverb by Malekko and the GreenWood prog, Filter and Freq Shifter. The Erica Pico DSP might be a good source of ideas, in terms of the selection of effect types to include in the default image. It also uses the FV-1 chip. TBH, this is what i'd expect/hope people will do (same goes for Dervish itself though. haha). But i know some builders won't & will stick with the default. It's probably more important with this where it's harder to view what bank you're running, & for a live/performance module you'll only want the programs that you'll be using. I don't think so, no. Assuming all the programs are all freely available, give it a unique name & I'll be happy to add it to the set of banks i make available. That looks not dissimilar to a mix of programs that some of the example Spin banks have. Would people want a mix of programs in a single bank ?. For people who don't mind doing their own customisation, for a live set say, they could fill it with 11 slightly different banks & move through the banks as the set progresses. also i'd be happy with whatever you choose for a default bank.. Yes, please! I'd like a handfull if possible, PMed. Interested in x2! I like the idea of having reverbs in one bank, delays in another, etc. I haven't updated my dervish in a long time, I've been using the shimmer on pretty much everything. one complete set of everything please! thx for sharing. A while back, i merged the Dattorro reverb bank + Dattorro Shimmer banks & added a couple of additional modifications (LPF on the input, variable pitch shift for one of the shimmers). It's been in the current Dervish image for a few months now, but I did that with µDervish in mind, thinking that this would be one of the banks, & then having another reverb bank with assorted Spin programs & the Malekko reverse one. That'd cover the 2 reverb banks. Then i'd just have to find 2 banks for delays (echo/flange/chorus etc). Thats going to be harder as there's so many combinations of echo. I'm thinking more about offering 2 default images, as people seem to be split between wanting banks of mixed effects & banks with just one type of effect. So, one image with (say) 4 banks of just one effect, & one image with (say) 2 banks of mixed fx. I'll take one set, please. it would be awesome to be able to change banks, changing the eeprom from the front panel or with a cartridge. kind of like tip top ZDSP. Each card has to be written at some stage. You'll still need a programmer to do that. So if you're writing to an EEPROM on a cart, you might as well write to the EEPROM on the DSP board. And there's the small matter of there really not being that many programs freely available. There's only just enough to fill a 64kB EEPROM. You'd struggle to fill 128kB unless it's small variations of the existing programs. Don't fit the EEPROM on the DSP board. Design a 2HP expander with a slot in the front panel that'll take a card like that either with some form of polarised edge connector. With hotplug support. Run the I2C bus + 3V from the DSP board to the expander board. 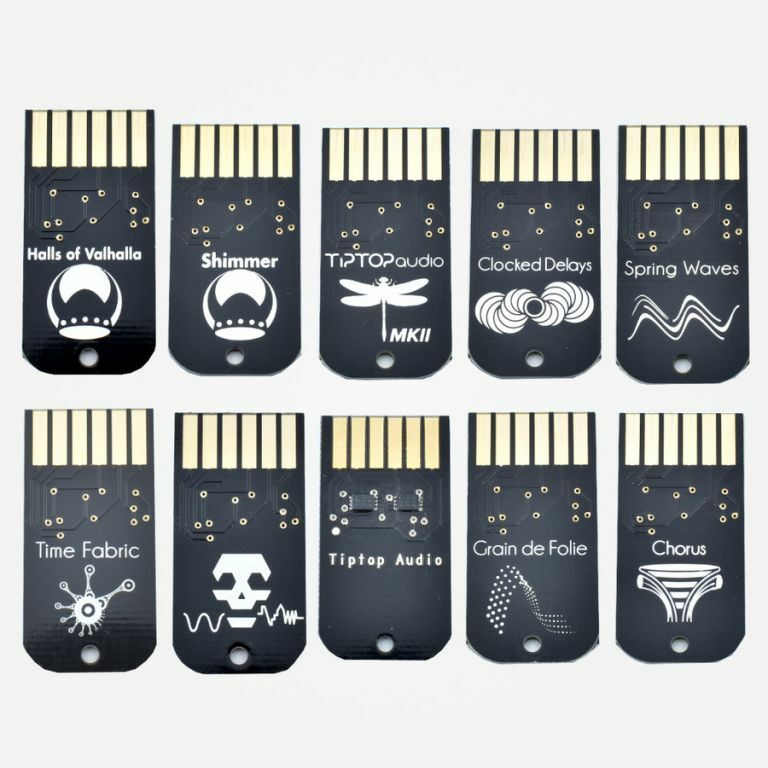 Build a programmer shield that has a similar connector for the carts so you can program them remotely. *If you want storage for more, use a 128kB EEPROM. With code changes, Dervish will fully support it, giving you something like 23 banks. uDervish will mostly support it but only up to 15 banks, a limitation of the single digit display. Whenever i've asked people whether they want extra program storage in Dervish they've always said no, 11 banks is enough. If people want the extra storage space i'd consider adding support for it. One benefit of the 128kB EEPROMS, you have the option of 1Mb/s I2C & larger page size, so bank loads are faster. Hello, I would be interrested in two pcb with the smd components soldered on it. Is it an option? This is due to my eyesight getting every year more bad as I'm getting older.